When we run into someone, we usually ask “How are you?” Since it’s rhetorical, this question usually garners the expected superficial response, “I’m fine, thanks, how are you?” The question doesn’t dig deeply, doesn’t attempt to make a meaningful connection. I recently assisted at a 3-day Fulfillment class with CTI, the Coaches’ Training Institute. Students had come from varied backgrounds in terms of geography, career, and life experiences. I volunteered to assist the leaders and help to make sure things ran smoothly. …in short, what lights us up and made us feel alive. Aliveness and connection are the foundation of a fulfilling life. I see this emerge in my coaching clients when they move towards what they’re passionate about. It’s easy to be complacent and pretend that what our heart tells us isn’t really important. We resist what’s new because the unknown feels scary. We settle for what we don’t enjoy but think ought to be ‘good enough.’ Sadly, this leads to flatness, deadness. Picture a heartbeat on an EKG that has flatlined. In contrast, coaching offers a vision of life that is resonant and full of purpose. Values are clarified, goals are determined, and actions are aligned with values. Now, that’s a life with a pulse! Living a fulfilling life is a radical act. A coach finds out what someone really, truly wants to do, and asks them to take action to get it. How often are we asked what lights us up, and are held accountable for taking baby steps toward making that happen? What’s a radical act for one person may not be for another. Someone who never exercises may find that working out 3 days a week is radical and life-changing, while someone else may sign up for a triathalon. We are all unique. The important part is what that action means to us as individuals–what direction it has us pointed in, what we learn, and how we grow from doing it. We have the power to visualize a fulfilling life and to go out and get it. Call or email me for a free 30-minute sample coaching call today. When I was younger, I would play Sim City. You got to build entire cities, with roads, fire stations, waterfront houses. Sometimes an earthquake would destroy it all. In my twenties, my brother gave me The Sims for a birthday. It was thrilling for nostalgia’s sake, plus it added a new dimension. I developed my virtual people’s job skills, relationships, and home decor. I played it ardently. For a short period of time, I recall, I could easily spend most of the weekend tending to my Sims. I sent them to work, I brought friends to their houses for parties, I clicked a single button to make them read about cooking and presto, they could whip up a 4-course meal. Would that life’s returns were that immediate. The game is alluring because at a click of the mouse, my Sims are off and running, accomplishing great feats. If I want to learn how to cook, improve job skills or build new friendships, it takes time and consistent effort. The feedback loop isn’t as immediate. Rewards take time to reap. I need to take satisfaction in more gradual changes. Last weekend, my little sister from Big Brothers Big Sisters told me that you can get The Sims on your iphone. I told her about my experiences with video games, where they can be fun but it’s hard to turn it off after, say, a half-hour. Yet armed with this knowledge, when I got home that night I downloaded it on my phone. The allure of fantasy is strong, the “rewards” immediate–but fleeting. Once I had my Sims garden to earn money and buy a new stereo, what then? I was given new “challenges,” but how challenging were they? Playing The Sims is addictive, but the second I stop, I feel empty, not filled up like when I swim or write a blog post. It’s like crack cocaine. I need another fix. Video games are fun–they’re so fun, in fact, that we can’t handle them. Much like eating Chewy Chips Ahoy, gambling, and other risky behaviors, human beings aren’t cut out to do them in moderation. We’ve primed for the quick fix, the sugar high. This is why I very rarely keep Chips Ahoy in the kitchen. I’d rather have a nice dessert at a restaurant, anyway. What’s different when I listen to what my body and mind need? I feel deeper rewards. Not the high of the sugar rush or adrenaline rush, but a more sustainable “I’m on the path. I made this happen.” Whether it’s getting out of the house early in the morning to go for a swim, or accomplishing a difficult project, the payoff is far more satisfying than the addict’s quick fix. I recently wrote this blog post about Flannery O’Connor and the power of habit. O’Connor wrote every morning from 9:00 to noon. We are the habits we develop. At a certain point, they become not so much a matter of willpower, as second nature. Our commitments and persistence make this happen. 1. Smart feet: put myself where I need to be, and the rest will follow. Convincing myself to get started is always the hardest part! Once I’m there (whether at the pool or on my website), I know what to do. 2. Focus on what’s in front of me: I can’t solve something that’s three steps down the road. I can only take the next right action, and see what its consequences are. 3. Keep my word to myself: I do this by putting my commitments to myself in Google Calendar. To keep the same examples, even if it’s swimming and blogging, if I don’t do them I make myself delete them from the calendar, and I hate doing that. I’d rather show myself that I’m trustworthy by keeping my word, just as I keep it to others. I’m not quite ready to delete the game from my phone, but maybe I can mention it to my coach. She would probably ask, “What if you just deleted it?” In the meantime, I’m cooking a veggie frittata, blogging, and can’t wait to go swim. How will you keep your word to yourself today? What are you committed to? How wil you honor those commitments? I’d love to hear what you think. Please leave a comment or send me an email! Creativity is such an important resource for both our professional and personal lives. Whether you work at a large corporation or are an entrepreneur, whether you are a marketer or a musician–all of the above which have applied to me–creativity allows us to think in new ways, unearth novel solutions, and construct the world we live in. Think of a seven-year-old with a Lego set. From our earliest days, we are primed to create. It transforms work into something that is both playful and productive. So how does creativity happen? Where does it begin, and how can we follow it to completion, rather than giving up? Determine what you want to create: a new system for working as a team? A piece of music, writing or art? Visualize the results to build resonance and commitment. Identify where you are today. If you want to publish a novel but have never written more than a page, that’s good information. Focus on the next steps to take that will bridge the gap between where you are and where you’re going. Step 3 is critical juncture and is often where people throw in the towel. However, rather than grow discouraged, focus on Step 1 again to recommit to your purpose. Then return to Step 3, breaking down what needs to be done into mini-goals. The piece also specifically explores creativity’s benefits for highly sensitive people. It proposes that HSP’s often experience less agency when working with others, since they are outnumbered. In contrast, by tapping into creativity, they can better control their agenda. Using their natural creativity, allows HSP’s to be more influential. Much like the seven-year-old with the Lego set, seeing our dreams come into reality is satisfying. It offers a sense of purpose and completion. Creativity is about more than having an idea. It is about making something new in the world–taking something that is within us, following the thread of our vision, and bringing it out into the world so others can also experience it. When I coach clients on creativity, we explore all three of the above steps to identify a purpose or goal, articulate the current reality, and brainstorm ways to bridge the gap. If a goal has enough resonance, the work that needs to be done will be clearer. Focusing on just one small step at a time builds momentum. Are you working on a creative project? Have a vision or goal but seem to get stuck before the finish line? Email me now at marywcrow@gmail.com to schedule a creativity coaching call. I offer a free session to see if we would be a good match for each other. Wishing you great creative success! Enthusiasm: a positive attitude, energy. Courage: doing what’s challenging and what most won’t do. Endurance: physical, emotional and intellectual energy to consistently and sustainably do what must be done. Integrity: doing precisely what you say you’ll do; requires self-knowledge & wisdom. How do these standards unleash the power of our values? For example, if independence is a high value of mine, by practicing enthusiasm, courage, endurance, and integrity, I will attain a greater degree of independence. Similarly, if community is a strong value, these standards can help me build a stronger sense of community. In a future post, I’ll delve more into endurance. As a runner, I know the importance of looking at the long haul and keeping at it. It won’t do any good to run 1K and stop if it’s a 3K race. This concept is so critical and it’s the reason I named my coaching business Passion + Persistence. An outward perspective asks questions such as: what is the market like? How many job openings are in that field? Where does one find those types of jobs–in a large or small company, at a nonprofit or an academic institution? In which parts of the country? Looking inward is at least as important. An inward perspective seeks to know: where do I see myself in five years? What types of tasks have I enjoyed the most in my past jobs? What values most fulfill me at work–creativity, security, autonomy, or interdependence? Do I enjoy mentoring others? Do I like to engage frequently with coworkers or to have long stretches of time alone? Self-reflection leads to self-knowledge and, ultimately, yields greater job satisfaction. Moreover, it makes it possible to have a more profound impact on the world. When we understand our own values, we live and work more authentically, because we’re going with, rather than against, the grain. Our natural talents and abilities find fuller expression. We are doing what we were meant to do in the world, and equally important, being who we were meant to be. Reflecting on the parts of ourselves that we both like and dislike grants the power of choice. Am I nurturing? Intellectual? Playful? Driven? Am I jealous of coworkers? Do I fear economic insecurity? It’s powerful to choose which parts of ourselves we’ll hold onto, and which parts we’ll change. Once we see ourselves as we are, we can choose to let go of the obstacles standing in the way of our own success, and embrace those characteristics that make us uniquely ourselves–whether we are fierce, radiant, intuitive–whichever traits make us the most alive and allow us to share our greatest work with the world. Yes, it’s important to study the market and to be realistic about our options, when considering a career transition. It’s also critical that we not choose passively, or out of fear that we won’t find anything better. By delving deep into our vision of our future selves, our best selves, we can choose wisely when considering such a transition. Where do you see yourself in five years? Where are you now and where do you want to be? What’s one tiny baby step you could take this week to move towards that vision? I invite you to consider how you might use the standards of enthusiasm, courage, endurance and integrity to move closer to it. I’d love to hear your thoughts. Please leave a comment or share this post. Wishing you great success and authenticity in work and life! As Web MD points out here, two mistakes that people often make are snacking mindlessly, or not snacking at all. Eating small portions of nutrient-dense food in-between meals stokes the metabolism and helps prevent binges. Try to eat snacks with a mixture of protein, high-quality carbs, and good fat, like hummus made with olive oil on whole-wheat crackers. This will give you an energy boost and help avoid binges when sweets appear. I remember well the temptation of ice cream or other treats in the office kitchen at 3:30 in the afternoon. At the magazine publisher where I worked, the test kitchen would share their creations–everything from ice-cream cake to homemade doughnuts with chocolate drizzle. I knew I’d feel sick after eating a whole doughnut, but I did it anyway! That’s when I recommitted to stocking up on healthy snacks. If I eat light fare every couple of hours, my energy stays high, my metabolism gets a kick, and I’m happy just having a bite of dark chocolate or a bite of a doughnut instead of a whole one–or even passing on the doughnut. Pay attention to what your tastebuds are telling you. Do you crave something sweet? Try having a small glass of cranberry juice with dinner. Do you want a crunchy texture? See if you can satisfy it by adding wheat germ to your cereal or yogurt. Do you miss chocolate? Let yourself have two bites, or try a high-protein chocolate drink made with whey. Above all, be creative with whole foods and fresh ingredients. Try slicing ripe tomatoes into whole-wheat pasta with olive oil, garlic, basil, oregano, and a dash of sea salt or crushed red pepper; serve hot or cold. Be playful with color, texture, and taste, so you won’t get bored and eat mindlessly. Food is meant to be experienced, enjoyed, and savored. Let food prep be as much fun as the meal itself. Enjoy selecting ingredients, herbs and spices in whatever combination suits you. Cooking is creative–get your senses involved. If you’re famished, have a light snack while you’re cooking, so you won’t overeat. For example, nibble on some olives. Deprivation and crash dieting are self-sabotaging, but all too common. behaviors. We can’t cut out entire food groups, nor should we. I remember the fat-free craze of the ’80’s and ’90’s, with products such as Snack Wells cookies. While low-fat, they were still high in sugar and simple carbs. It’s important to get enough fat, protein, and carbs, but the right kinds. Aim for nutrient-dense foods like fish, lentils, olives, nuts, avocado and quinoa, to name a few smart choices. Treat yourself to a colorful Greek yogurt and berry parfait for dessert. If you’re going to cut out a ‘food group’ entirely, let it be trans fats, which raise bad cholesterol (LDL) and lower good cholesterol (HDL). Other than that, let yourself enjoy the occasional pat of butter, maybe as a special treat, opting for olive oil the rest of the time. If you want to have a candy bar a week, really enjoy that candy bar. If you’re craving full-fat dairy, just work it into a rounded diet. As long as you aren’t eating several foods high in saturated fat on a daily basis, it’s fine, our bodies actually benefit from a certain amount of saturated fat. Just don’t overdo it! If you choose to eat animal-based products–eggs, dairy, fish or meat–still aim to eat a mostly plant-based diet with plenty of vegetables, fruit, beans, nuts, and whole grains. Balance is key, and making active, mindful choices is an important part of gaining balance. So enjoy putting your meals together. Let it be creative and fun. Then savor the flavors, really take the time to experience your food. This will let you eat more consciously, to be mindful of both quality and quantity, and above all, to enjoy it. Wishing you happy, healthy dining! As a wellness coach, I help my clients achieve their health and wellness goals. This topic is near and dear to my heart. While mixed messages abound, society mostly discourages us from living healthfully. Not only are we surrounded by processed food, but we’re often asked to be superhuman or machine-like, ignoring our physical and emotional needs. However, our needs are not luxuries–they matter. Wellness is one of the most important foundations of my own life. When I sleep 8 hours, eat nutritiously, limit caffeine, and exercise regularly, I feel at my best. My thinking is clearer, my energy higher, and I’m more tapped into my own creative force. When I feel healthy, I show up better in my relationships. I see my career-related options more clearly. Is it static? No–wellness has looked different at different points of my life. At one time, it meant rigor and challenge–training for 10K’s and a half-marathon. Other times, it has meant more variety, alternating short runs with kickboxing, rowing, or pilates. It has also meant doing yoga a few times a week, or swimming regularly. Living a healthy lifestyle is a fluid, often intuitive process. While there are some good habits I need to do everyday (flossing, anyone? ), as my life and needs change, I also change how I address my needs. I get to choose how much consistency, challenge, fun, and novelty I want at any given time in my active, healthy life. Am I bored? Maybe a 3-hour hike in the woods is in order. Am I tired? Maybe an easy swim is just what I need. Wellness also includes managing stress. At times of stress, I’ve been tempted to over-caffeinate, under-sleep, and under-exercise. When I don’t de-stress well, I neglect to find time to relax–taking walks in the park or meditating, for example. Skimping on sleep and ramping up on caffeine or sugar never turns out well. When I try to cope with life in those ways, I’m trying to do more than is humanly possible. The truth is, basic human needs matter, and they don’t go unmet without consequences. If I deny them, I feel a deficit–whether the deficit is sleep, nutrition, or having fun. If that deficit persists, it affects all areas of my life. These days, life looks different. Nurturing myself is one of my top priorities, because it makes my life flourish. Relaxing and enjoying life are key components of health and wellness. A day that includes gardening, writing (with my calico cat keeping me company), playing the piano, or even watching “Frasier” on Netflix is a restorative day. We all need time to pursue our interests, be in nature, and simply do things that we enjoy. What does relaxation give us? When we’re relaxed, we’re open to possibilities. We experience gratitude for what is. We’re connected to our inner selves and to others. It gives us joy and curiosity. We enjoy better health and more energy to refocus on what’s ahead. In honor of spring, I spent a good few hours over the weekend de-cluttering my kitchen. It had become painfully obvious how much inconvenience I had been tolerating: my microwave was about a foot off of the floor, requiring me to bend down to make a cup of tea; one of the cabinets in prime real estate was filled with paper plates, camping dishes, i.e. junk; and the coffee maker was on a porous stand so that when we poured coffee, drops would leak onto the floor. The best case in point is the Tupperware Saga: pictured to the left, in a yellow Hoosier cabinet passed down to me through my mother’s side of the family. I have a hard time throwing anything away. 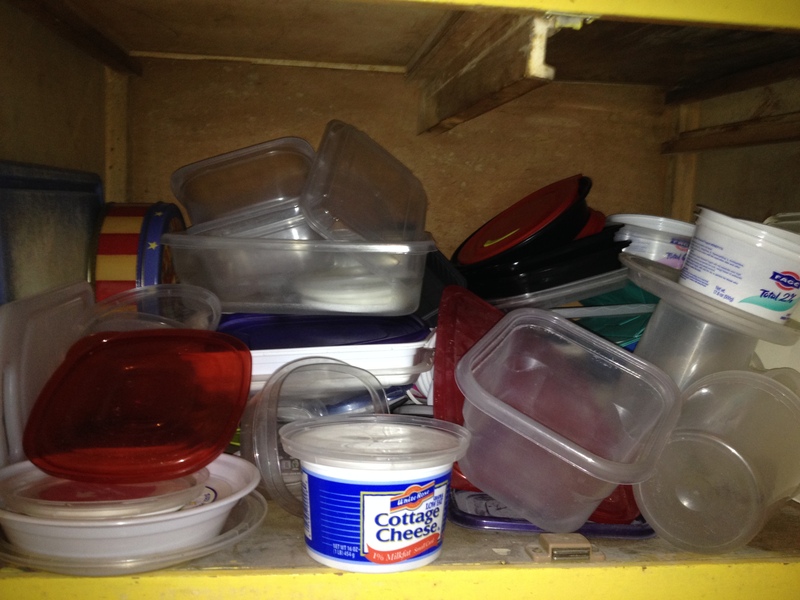 Consequently, most of my tupperware containers were either missing lids or were 10 years old and showing their age. Also, any containers that didn’t fit in the Hoosier cabinet spilled over onto the counter tops, competing with space for food prep. Frugality has served me well in many areas of my life (I attribute it to subscribing to Pennywise magazine when I was a pre-teen)… but this wasn’t one of them. I finally reached a breaking point. I didn’t always know where to find things in my kitchen. I threw away 98% of the tupperware and kept only matching ones that were in good shape. I used the newfound space for pots and pans. I moved the coffee maker to the counter, and filled its old space with the microwave, which now sits at eye level. Why do we tolerate things that we have the power to change? There can be more than one reason. In my case, the disorganization of my kitchen was neither urgent nor hugely important. I was adaptable enough to make it work–until I no longer wanted to put up with it. Gretchen Rubin has blogged about putting aside an hour a week to do such things, as part of building good habits. Otherwise, we can procrastinate endlessly, and what begins as a small inconvenience snowballs. Our time is important, and I have so many more meaningful things to do on the weekends (e.g., practicing music, playing bocci in the park with neighbors) that I hadn’t set aside time to organize the kitchen. However, the disorganization eventually turned into a big time sucker. All those wasted seconds and minutes add up. After I finished reorganizing the kitchen, my feet and back hurt. Still, I felt pleased and took pride in telling my husband what I had done. Even to my own ears, it sounded so pedestrian, so mundane–yet it was satisfying to have some control over my physical environment, like a bird building a nest. What worked? For me, it helped to turn the job from a “should” into a “want.” As long as I thought, “I should organize the kitchen,” I didn’t do it. As soon as my thought became, “I want to have an organized kitchen where it’s easy to find things and do food prep,” I was motivated to take action. By keeping this “want” in mind, and banishing the “should,” I intend to prevent the kitchen from escalating into a big project again. Even if orderly tupperware falls into the “not urgent” category, it actually falls under “important,” when I consider the effect that my living space has on me. It may not be as important as taking my Little Sister to a jazz concert at the Montclair Art Museum, but it helps me to feel happy and grounded. As with to going to the gym, building momentum and discipline transfers over into other areas of my life. For most of us, there are higher priorities than home organization. Nonetheless, it’s helpful to realize what we’re tolerating in a given area of our lives, to question why we’re doing so, and ask whether it’s necessary. As for me, I’m glad to have an organized kitchen, and feel a little more comfortable and secure in our nest–just in time for spring.